Brown leaves on Glossy Evergreens- Hollies, Rhododendrons, etc. Drought Damage- If damage showed last fall or early winter, this could also be damage from last summer's drought. As new growth begins, dead and weak branches can be trimmed to encourage growth in healthy parts of the plant. The previous two sentences were written several years ago. In 2002, we are seeing drought damage again in great amounts. A lot of plants are showing stress. Azaleas and other shallow rooted plants are getting hurt very badly. Mulch! Mulch! Mulch! Mulch helps greatly against this damage in summer and winter. It helps hold moisture in the soil and also reduces the sudden freezing of the soil. Roots are protected from wind and cold damage. Many plants, such as azaleas and rhododendrons have shallow root systems and benefit from mulch. Click here to visit Garden Guides description of different mulchs. Sunscald- Brown irregular spots on top of the leaf where the leaf is most exposed to the sun's ray's. 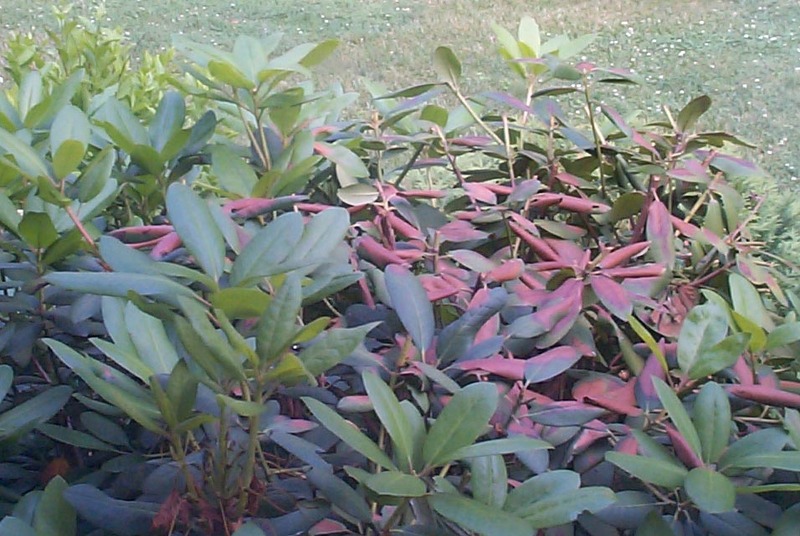 The rhododendron on the right was trimmed in late May on a hot Sunday afternoon. The burned areas are seen where the growth was cut away. Okay, I will try not to do that again. If damage occurs repeatedly to a plant, an application of an anti-dessicant, such as Wilt-Pruf, can help greatly in protecting the leaf. This can be used in late fall and also during summer stress. This coats the leaf and slows the moisture loss from the leaf.